The second seaport city of Antalya is Olympos. This ancient city is situated on the southern of Mount Tahtali. Whether coming by sea or land do not miss the Olympos Valley shaded with oleander and laurel shrubs and the refreshing quiet pools of flowing water. The design of the mosaics in the Olympos bath is enhanced by the play of light while a temple gate and a theatre are of interest along with the other walls and towers around the bay which date from the Middle ages. North of Olympos, up from Cirali Beach, is Yanartas (at a height of 300 mt) where, according to mythology the fire breathing monster, Chimaera, was slain by the Lycian hero Bellerophon who was mounted on his winged horse, Pegasus. Nearby you can see remains from the Byzantines who attached religious importance to the area. Tranquil waters and sandy beaches line the Bay of avus, situated south of Olympos. This enchanting bay is yours for an unforgettable experience of water skiing on glassy water, for discovering the colorful marine life in waters clear enough to see the bottom, or exploring the incredible sea caves on the northern shore. 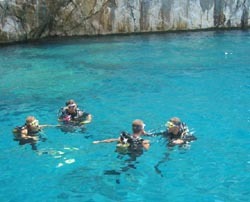 Olympos is a excellent place for scuba and rock climbing.